Automatic Gate Systems - Better By Design. With current manufacturing techniques and the latest technology, gate automation may be less costly than you think. 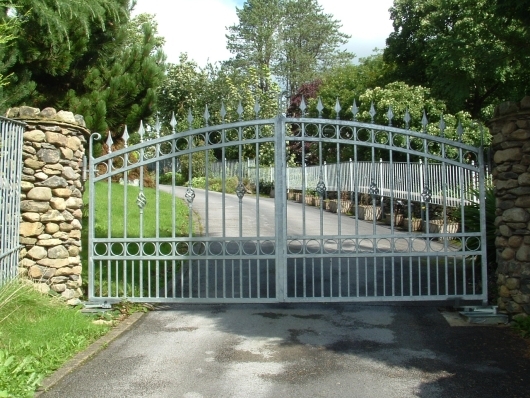 Automation will further enhance the benefits of having gates at the entrance of your property. Imagine the simplicity, added security and convenience of opening and closing your gates by remote control without having to leave your vehicle. Automation avoids the struggle with large and heavy iron gates that many people encounter, a simple press of a button on a remote control allows access. You could also set up an intercom at the gateway to speak to visitors before you let them in. On the security front, electrically automated gates have strong geared motors making it difficult for burglars to force open the gates and additional locks can be added for maximum protection. Gate automation is a fairly straightforward process but there are a number of options that can be chosen for each application. Gates can be automated to either swing open or to slide open and in the case of swinging gates the opener may be concealed underground or may be gate mounted. The most suitable opener for your installation will depend on the space available and the type of gate selected, we will visit your premises to advise on the the best possible solution for your particular requirements.